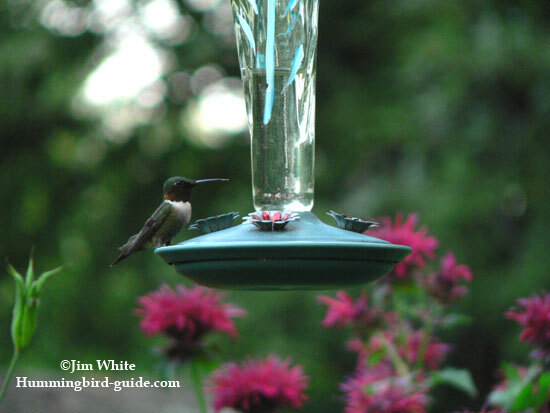 Here is a homemade hummingbird nectar recipe to use now that you have purchased several hummingbird feeders and decided where to hang them. Changing Nectar: You must be vigilant about changing the nectar regularly (every 3 to 5 days) to keep it from spoiling. 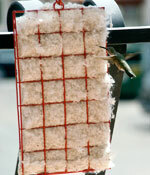 Cleaning Feeders: You must keep your feeders clean from bacteria which can be harmful to hummingbirds. Here is a really handy pitcher that we use. No measuring cups required! "Once you use it, you'll NEVER want to mix nectar again without it!" Here are step by step instructions to make hummingbird food with the formula for the sugar to water ratio that you can print. 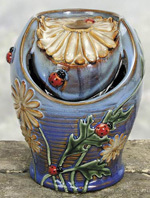 For a large selection of Hummingbird Feeders, Accessories and Wind Chimes: Visit Our Store! 4:1 ratio, that is, 4 cups of water to 1 cup sugar or make more or less volume if so desired. Step 1: Bring 4 cups of water to a boil. Step 2: Add 1 cup of white granulated sugar. Step 3: Stir well until the sugar is dissolved. Step 4: Boil this mixture for 2 minutes to help prevent it from spoiling too rapidly. Step 5: Allow to thoroughly cool. Step 6: Pour into clean hummingbird feeders. Use a larger 4 parts water to 1 part sugar mixture to make a bigger batch of nectar. Do not use honey as this can cause a fatal infection to a hummingbird's tongue. Artificial sweeteners or sugars have no nutritional value. Please don't use them. We have been using this nectar recipe for years and we have had many hungry birds at our feeders. We hope your feeders will be as busy with hummingbirds enjoying this delectable treat! How to Fill Your Feeders. 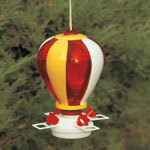 Let’s begin with the many types of hummingbird feeders. 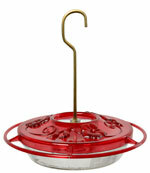 Just to get an idea take a look at the variety of feeders we carry in our Hummingbird Store. There are Basic Feeders, Decorative Feeders, Tray feeders, Window feeders and even Unique feeders. They all should come apart for easy cleaning and filling. People often ask what size feeder to buy. A large feeder does not necessarily bring a lot of birds. However, if you live in a location with a lot of hummingbirds and do attract many, use a large feeder that holds more nectar. Otherwise several smaller feeders will do the trick. The size is important in regard to the nectar because it is helpful to fill your feeder with an amount of nectar the birds will drink within 3 to 5 days. Otherwise, you will waste nectar. The nectar needs to be fresh and changed every 3 to 5 days. The consequence of not keeping the nectar fresh is that your hummingbird friends will go elsewhere where there is a 4 star restaurant. 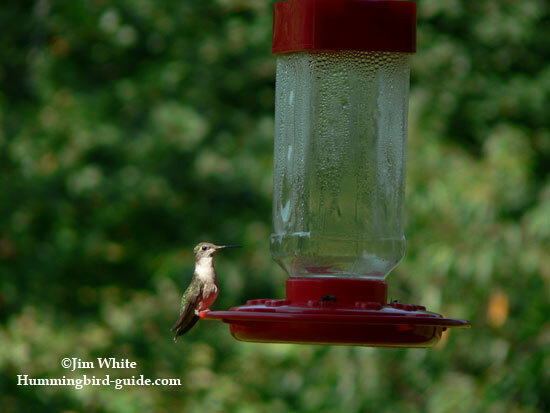 We get many emails from our visitors asking why they are not seeing their hummingbirds. Most of the time the reason is that the nectar in their feeders had spoiled. Do Not Use Red Dyes or Food Coloring! Many people still believe that it is important to add red food coloring to their nectar recipe. As we have mentioned this practice is unnecessary to attract hummingbirds. 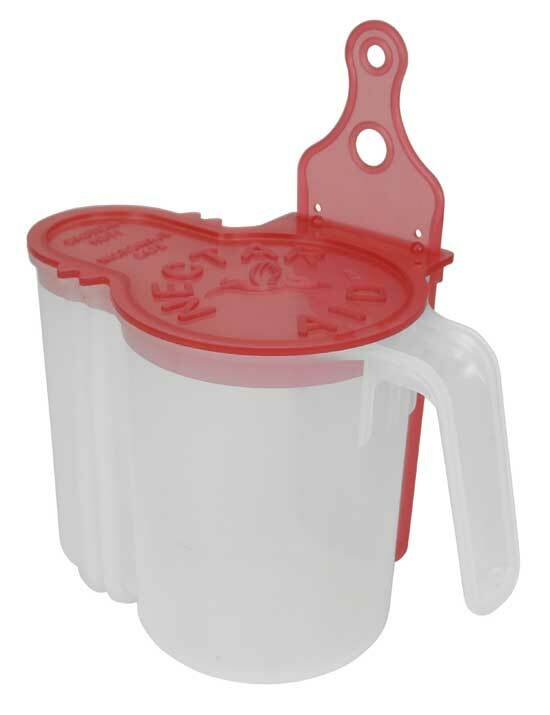 A red feeder or a feeder with red feeding ports will suffice. (As you can see in my photo above, this feeder is green with clear glass and red flower feeding ports.) Most researchers and naturalists discredit this practice as harmful to the birds. We want to replicate the nectar found in nature. Since hummingbirds are wild birds, doesn’t this seem sensible? Let’s consider the possible origin of the idea. Hummingbirds have a high metabolism and don’t we love to watch these little birds zipping about in speedy flight. On account of this metabolism they do require high levels of nectar often found in red flowers. So people, in observing them, began to believe that the nectar they made for their feeders should be red. It is important to know that natural nectar, which is a mixture of sugar, water, and electrolytes, is colorless. How to Clean Your Feeders. Choose a feeder that is easy to clean since you will be doing this frequently. A feeder that we especially like that is very easy to clean is the Dr.JBs feeder. I did write a review of this feeder with more information and details. If you prefer a "tray style" feeder another feeder that we especially recommend is the Hummzinger line of Tray feeders. This feeder is also very easy to clean with added benefits to the photographer. For more details, I also wrote a review on this feeder. My favorite "window feeder" is the Aspects "Jewel Box" feeder. Its very easy to clean and has 2 options for mounting and installation. I also did a review on this one. I clean my feeders at a sink with brushes and a tiny amount of dish soap and water. Rinsing the feeder thoroughly to remove all traces of the soap. If there is a soap residue left behind it could alter the taste of the nectar and repel the hummers. Another method is to use a water and vinegar solution, about a 4 to 1 ratio of water to vinegar. Again, rinse the solution well and leave no vinegar residue. If you see mold present in/on your feeders, you need to change your nectar sooner with more frequent cleanings. (I clean my feeders every time I change the nectar to avoid a mold situation. Some clean their feeders at every other nectar change.) To rid the mold, soak the feeders for 1 to 2 hours in a very mild bleach and water solution. A 10 to 1 ratio should be fine. The soaking will kill the mold bacteria and prevent further growth but the discoloring will still be present. After soaking, clean the feeders thoroughly with brushes. Another detail about the nectar recipe is that it can be adapted. This recipe of 1 part sugar to 4 parts water is adequate for the spring and summer months. One exception would be when we initially attract the birds. At this time you can make a stronger mixture of 1 part sugar to 3 parts water. When our hummingbirds have settled at our feeders, change the recipe to 1 part sugar to 4 parts water. This recipe is actually a little closer to the nectar found in nature. Another time to adapt the recipe is before the Hummingbird Migration. Did you know that these tiny birds need to bulk up and double their body weight in order to successfully make the long migration journey? Can you imagine doubling body weight is so short a time? So it is recommended by scientists that we increase the recipe to 1 part sugar to 3 parts water for a month or so before the expected migration. It is a misconception by some that nectar is a replacement for water. True nectar is a liquid but hummingbirds, like all wild birds, need a water source.